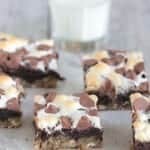 These Kitchen Sink Cookie Bars could not be more delicious and simple to take to your upcoming parties! Packed with all of your favorite sweets! 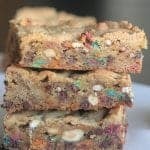 These Kitchen Sink Cookie Bars literally have everything but the kitchen sink in the dough….they are epic! 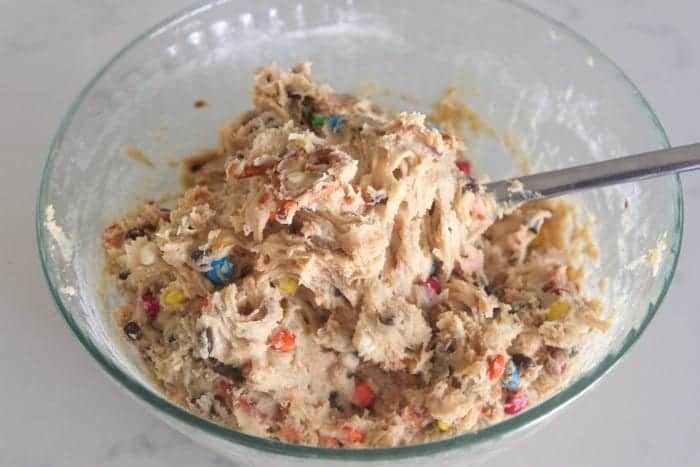 The nice thing is, you can add your favorite cookie dough ingredients, pretty much anything goes! Hope you enjoy this fun bar perfect for transporting to any party. Let’s start by creaming your butter and sugars. 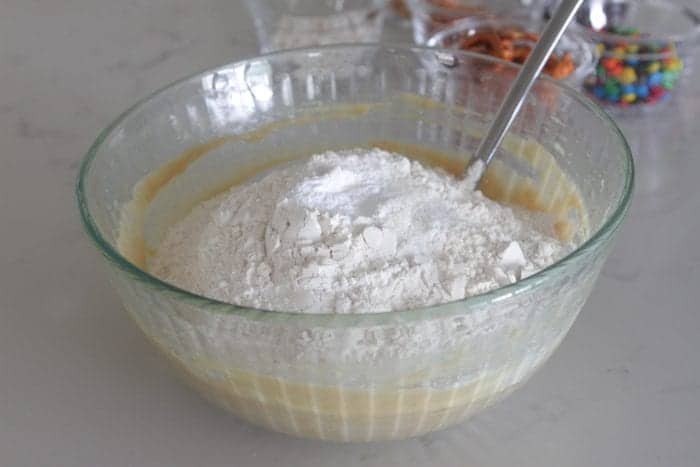 Dry ingredients up next, give a stir to combine wet and dry together. 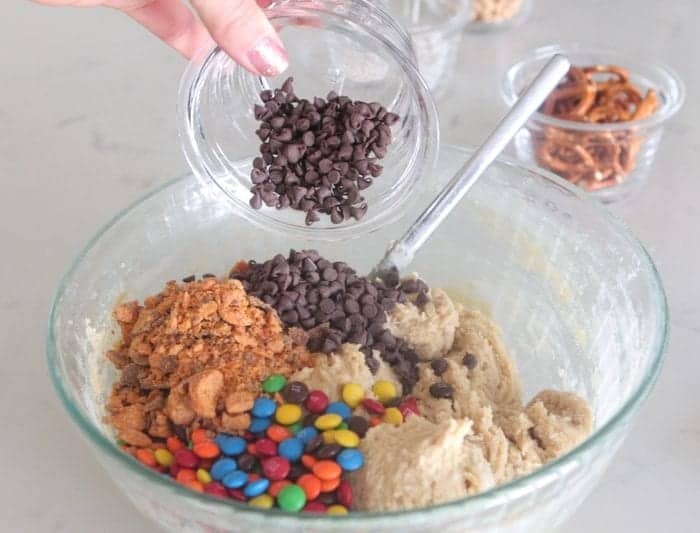 I also added mini chocolate chips. 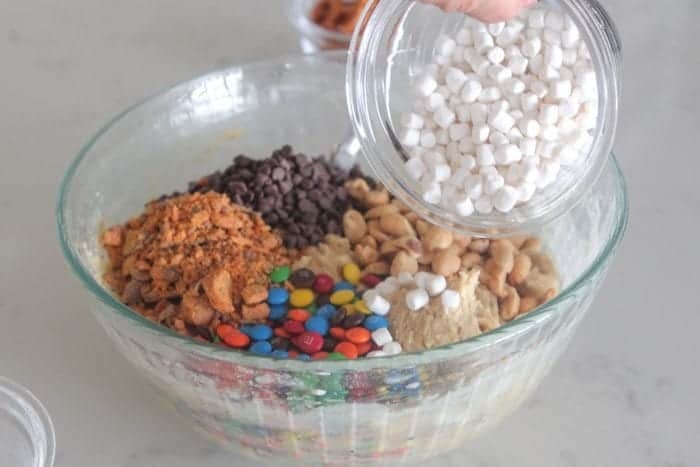 Mini marshmallow bits and peanuts. Also some pretzel twists that break up when you stir the dough together. 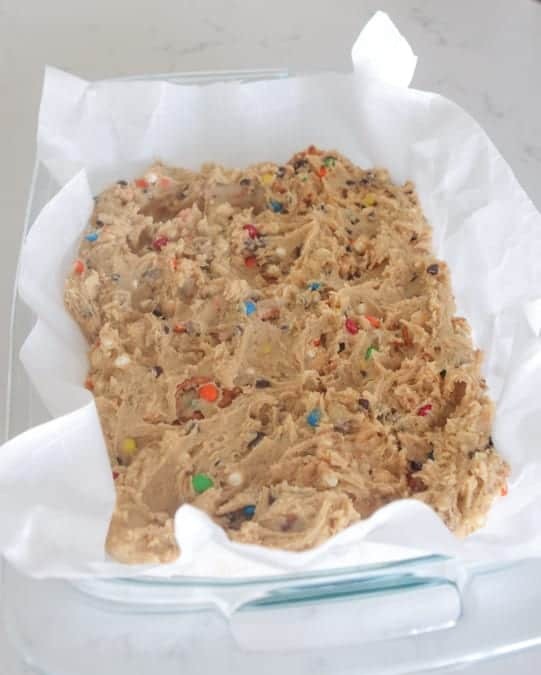 Press into your baking dish and bake! About 35 minutes. 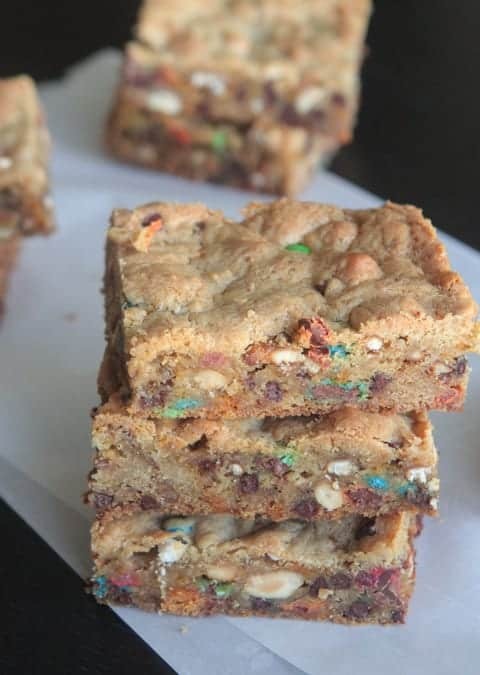 Once the bars have cooled, cut into squares and ENJOY! 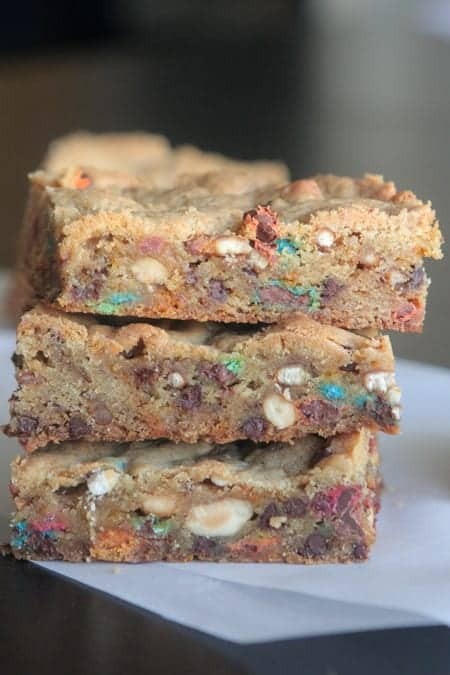 *Get creative with your Kitchen Sink Cookie Bars sweet add-ins, pretty much any small chopped chocolate candy bar or nut will work! *Store leftovers in an airtight container, room temperature or chilled for up to 3 days. 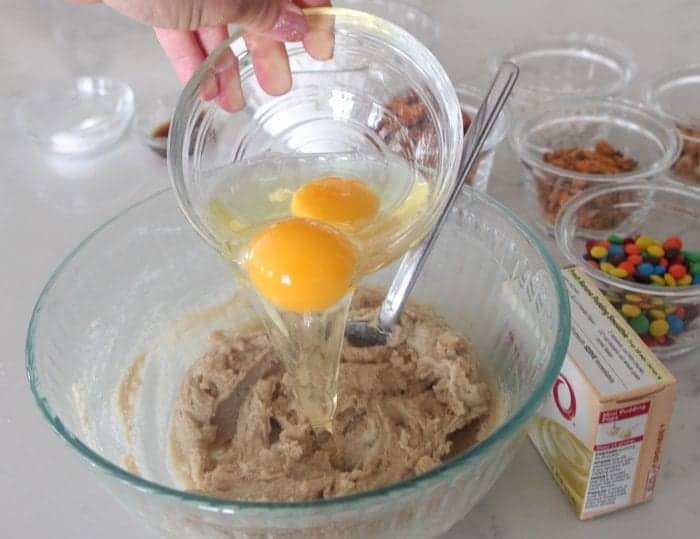 In a large bowl, cream butter and sugars until well combined. 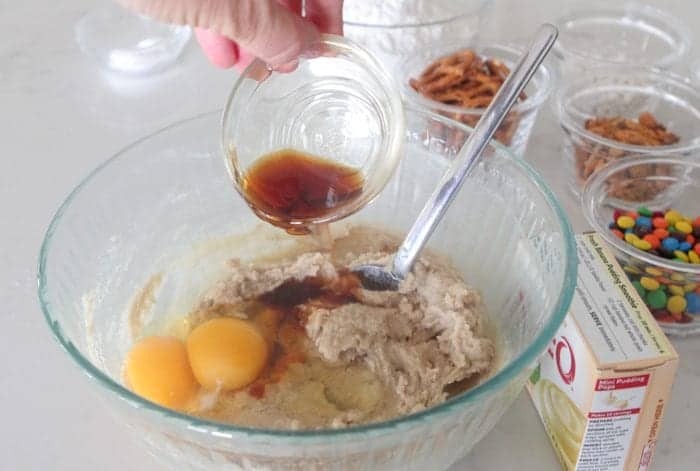 Add eggs and vanilla mixing until well combined. 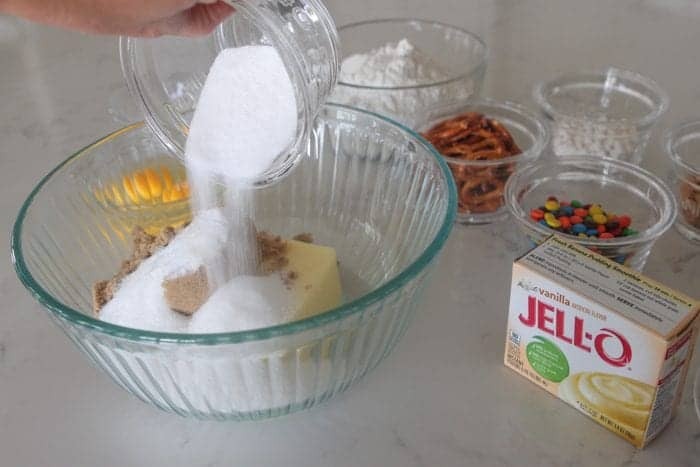 Slowly add flour, pudding mix, baking soda and salt. Stir gently to combine. 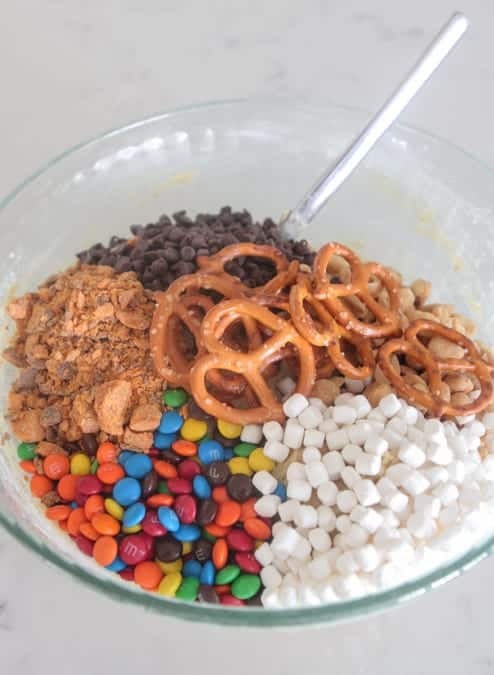 Stir in M and M's, butterfinger pieces, marshmallow bits, peanuts and pretzels. Stir to combine then transfer to baking dish pressing evenly. Bake for 35 minutes or until golden and baked through. 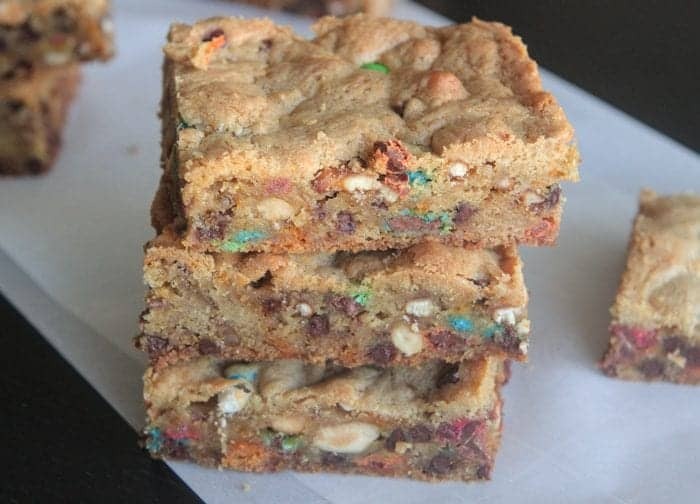 Let cool completely then cut into squares and serve. Yeah, I would definitely eat these! 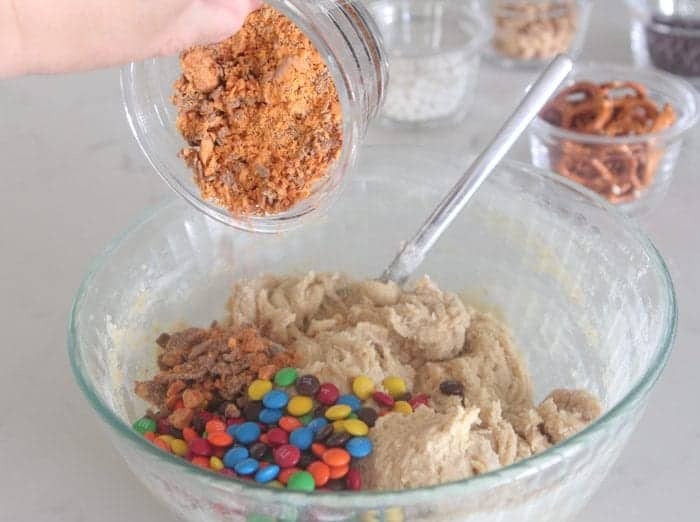 So many chunks! I can’t wait to take these to parties! Oh my! So many of my favorite things! I could sink my teeth into these! AMAZING! So many awesome ingredients! 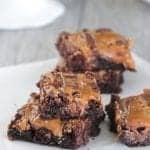 Wow, these look SO good right now!! content, however this blog presents feature based articles. Core Java (or) Java SE (Java Standard Edition) is most widely used Java programming languages for developing desktop applications. Wow….!! 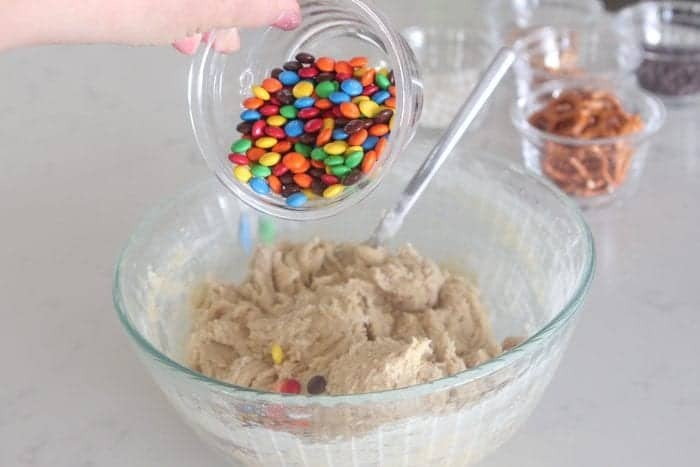 This is a best recipe for all. I love it, thanks for sharing your idea. It is an application which is designed for Walmart associates.Using this application,users can access the information and also they can get the latest updates from the organization.